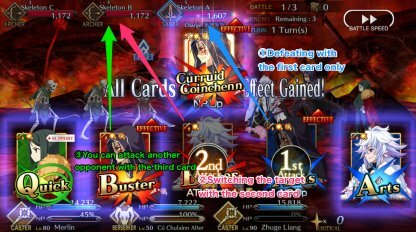 Here you can learn about FGO battle system and command cards. We also explain how choose the cards properly, so that you can you this guide as a reference. If you line up three cards of the same servant, you get an extra attack by adding the fourth card as a bonus, which is called Brave chain.Normally they are not easy to line up, but the NP card in the combination can make things easier. If you pick three cards of the same color you get a bonus called Chain. 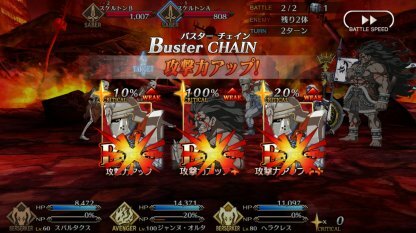 Buster Cards gain additional damage excluding the NP. Arts Cards charge all the participating servants' NP gauge by 20%. Quick Cards drop 10 C. Stars required for Critical Damage. Only the bonus of the 1st command card in the chain spreads on the whole chain, excluding NPs. 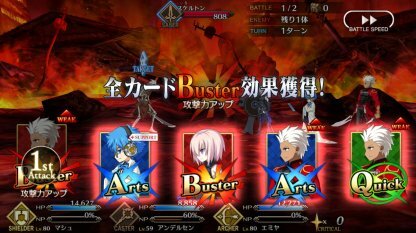 Buster Cards grant additional damage, Arts Cards extra NP gain and more stars dropped for Quick Cards. 1st Card bonus takes its effect from the beginning of a Chain and lasts until the extra fourth attack. If you line up cards of the same servants back to back, this servant will continue attacking a target even if it is destroyed with the 1st card resulting into Overkill. To switch a target after its death you have to break the chain with a card of another servant. 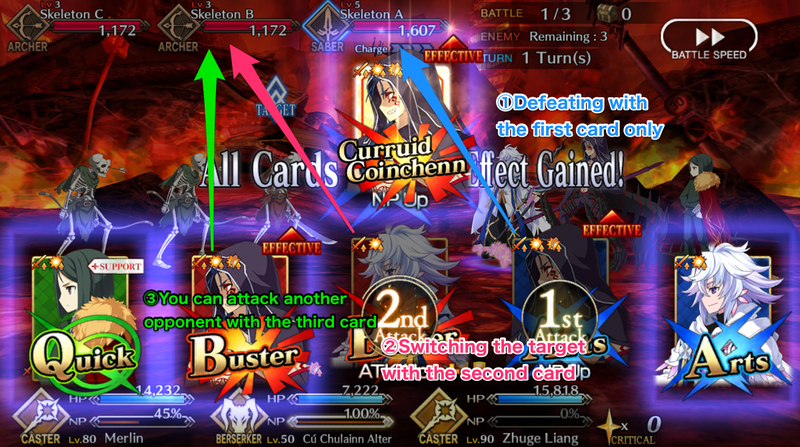 ▲In this case, after the 1st target get killed with the first two cards and another is destroyed with the 2nd, the NP card also targets the next 3rd enemy. Each servants have its own combination of cards. Making chains become easier if you pick servants aiming to get as many of the same cards as you can. However, at least one “Buster”, “Arts” or “Quick” command card will be there anyway. Command cards are distributed every turn basing on a certain rule, not just randomly.Each of 5 or 15 cards of the three servants in the front row are drawn during the next 3 turns. By taking advantage of the fact that drawn cards are not repeated for the next three turns, you can predict which card you are going to get on the next turn. For example, if you exclude 10 cards that have already been shown in the first two turns from the whole 15 card package, you can tell for sure which cards are going to be on the 3rd turn. Buster cards help you gain much more damage comparing to other cards. In comparison to Arts, the amount of damage can be 1.5 times higher. Also Busters sometimes give you a small amount of C. Stars required for critical damage. NP gauge basically cannot be gained with Buster Cards at all. When you place a Buster card first damage of the other cards except NP will increase.The amount of damage usually increases by 24%~52% depending on the type or the position of command cards. Cards except Buster that are originally weak tend to increase damage more. If all three command cards in a chain are Buster cards Buster Chain is going to be activated. When Buster Chain is activated, the Buster and Extra cards will gain Buster bonus thus dealing increased damage to enemies. If you use cards of the same color for Brave Chain, there is an extra damage bonus for Extra cards. As this bonus stacks with the first bonus, Buster Brave Chain is going to do much greater damage comparing to Brave Chains made with other cards. In FGO, NP is obtained per hit for each attack or for each time damage is done to you. Arts cards charge NP gauge per 1hit the most comparing to other cards.Each servant has the pre-set amount of NP that can obtained and it also varies depending on a class skill or enemy class. The amount of gained NP may vary between 0.8～1.2 times taking Enemy class into consideration. attacking Casters you gain 20% more：attacking Riders 10% more. So you gain NP faster then usual. attacking Assassins you gain 10% less：attacking Berserkers you gain20% less. So, both slow you down. 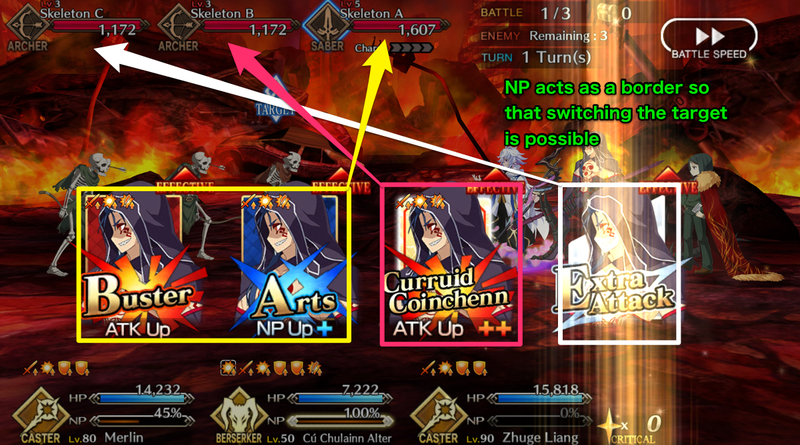 Attacking some undead type enemies such as Skeleton or Ghosts usually chargers your NP gauge even faster, but it is not always the case. Combining Critical and Overkill factors makes a big difference. 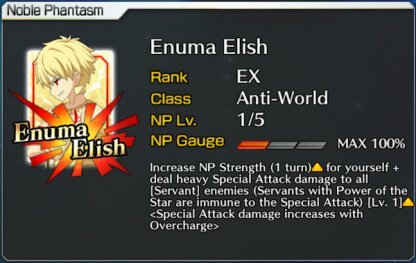 You can even strengthen the effect even more with NP buff skills. 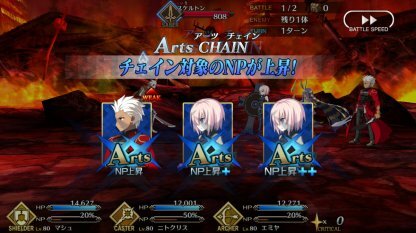 You can gain NP faster when you place Arts Card first. The bonus is applied to every hit, servants who do more hits with Quick or Buster cards rather than Arts will be able to gain NP efficiently. If all there cards are Arts cards Arts Chain is going to be activated. While the chain is activated, NP all servants who participate in the attack are going to gain 20% more NP. In the current META, if a servant has less Arts cards the more NP his is going to gain per 1 Arts. However, there is less opportunity to use servants who has only one Arts card and it is difficult to make Arts chain as well. To increase Arts effect alway try placing it third. In general, C. Stars cannot be gathered with Arts cards. 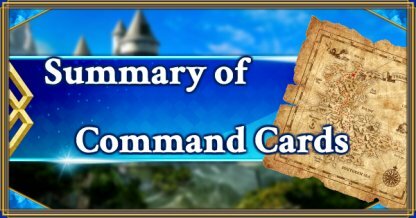 If you want to collect stars, you are going to need class skills such as “Presence Concealment”, CE, Overkill or C. Star Drop Rate buff. Line up 3 Quick cards to efficiently gather C. Stars that are essential for Critical Damage. Star Drop Rate per hit will be increased. C. Star drop amount caused by the 1st Quick card in a raw equals to the number of hits. If it is placed 3rd, star drop rate will be doubled. Critical Attacks double damage as well as they double NP Gain. Moreover they also increase C. star drop rate. So there are more benefits rather than just damage increase. Quick has the lowest damage among other command cards. However, the good thing is that Quick Cards can help you with both the NP gauge and C. Stars. For the most part you might want to place Buster or Arts to the 1st position for damage or NP gain and after that go for Critical Damage. NP gain or Star Drop effectiveness of Quick Cards mostly depends on the number of hits. You either gain lots of NP almost gathering no stars or vice versa. Although there are servants that can earn both fairly well at the same time, but these are very rare. Although it really depends on servants, there are servants that barely earn NP and C. Stars with Quick cards. According to the META, it's hard to play Quick cards in case they have less hits than Arts. From the one side, the star Drop Rate increases for other cards except NPs if you place Quick card first. But from the other side, the increase is so miserable that you can barely notice it. Quick chain can be activated by using three Quick cards in one turn. Although you Quick bonus allows you go get a bunch of C. Stars, note that you cannot gain enough stars for huge Critical damage by only activating Quick Chain. Servants that were added to the game long time ago, when the game was just released usually have a small number of hits. Therefore the stars don’t drop that often, but there are still servants who have three Quick cards and can help increase NP gain and Star gather rate for Servants such as Sanson or Phantom. Although NP cards do spread their 1st card bonus to the following cards, but they cannot benefit from bonuses of other cards. The magnification for damage and NP gain is just treated as if the card was placed first without any bonuses. Therefore it would almost always be a good choice to place it first. NP Command Cards are also treated as Arts or Quick just like other normal command cards. So you can if servant's NP is Arts, you are also going to have more chances to activate Arts Chain. You can choose to place the Arts NP in the third place and make Arts chain while saving the NP for later for more efficient Arts performance. If you select two NP cards in a row, you are going to gain bonus called NP chain. The second NP or anything added after that will gain 100~200% NP Gauge causing OverCharge to take place. OverCharge effect also depends on the NP of a Servant. 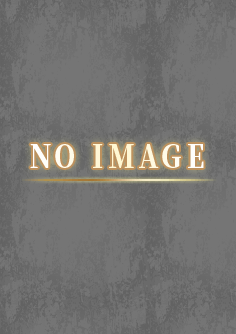 NP effect [Lv.1〜5] show your NP level which can be raised by fusing identical servants together. If it says OverCharge that means it will increase is its OC effect. Otherwise it means that its OverCharge effect is fixed. Choose carefully the effect you want from the 1st card, since it's going to affect the following 2 cards. Remember Buster for damage, Arts for NP and Quick are, you know. And try placing NP cards first for better efficiency. Placing Quick command card 1st does not actually give you much and won't have that much of an impact on a battle. 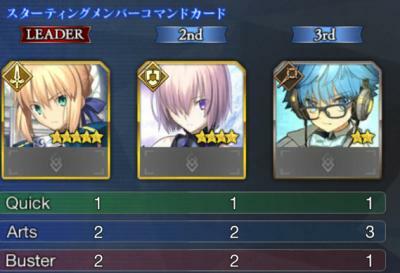 Buster or Arts should be selected to be placed 1st rather than Quick even if it is an NP card. Form party the way you would have as many of the same color command cards as possible to make Color Chains more often, thus efficiently gaining more damage and the NP. ▲If there are 7 Arts cards in your Party you can 100% activate Arts Chan at least once during 3 turns. Thus, it's going to be easier to trigger the NP. For example if you selected three Buster cards with 1 servant, both Buster Chain and Brave Chain are going to take place simultaneously. 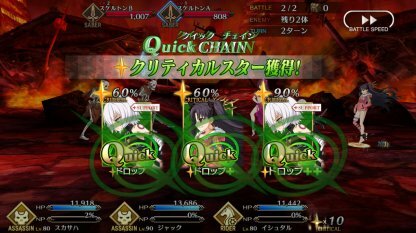 Combining chains this way you can gain damage and obtain NP more efficiently.